Wow, that's quite a rave review of Dorie's pie!! It was my first time trying banana cream pie and I liked it! BCP with vanilla custard is one of my favorite comfort foods. Your hubby is one lucky man! 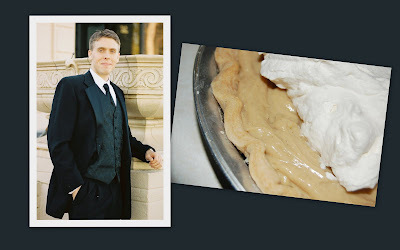 Your pie looks great- I'm glad it's such a loved recipe in your house...it is in mine now, too! Thanks for baking with me this week! I can see why this is a tried and true favorite in your house, Anne! I love the variations you've done. This is definitely the best banana cream pie I've ever had! I am glad to hear this is easy and has so many variations to try! I am going to have to get on it! I love banana cream pie, too, especially with a layer of caramel thrown in for good measure! My husband loved this pie to. I know I will be making it five more times. Is this not the best? I have made this twice since I was given the book on my birthday last July. My dh loves Banana Cream Pie! He IS a fine looking fellow, but then you're a fine looking gal! I love it when I find a Dorie recipe that gets made again and again! Too cute - I wouldn't have waited this long either, but my husband hates bananas so I ended up leaving them out! Wow, I know this pie must be delicious if you've made it so many times! I love your idea about layering the caramel in. How delicious! You're in good company...I love making (and eating) this pie! Looks great! I love banana cream pie so much (esp with white chocolate topping), I was sorry my grad work got in the way this week! With all of those suggestions for the filling, I might catch up to you real soon! It was delicious!